Almost one in five Americans are housed in schools for the better part of each day, but many of these schools offer toxic environments with poor daylight and are sited in far-off places, which means they are both unhealthy learning environments and contribute to sprawl (or unhealthy communities). Creating green and healthy schools which are in walkable, bikeable neighborhoods is key to increasing test scores and graduating children who can be future stewards of the environment. But how do we build green schools? This question and others were asked during the National Building Museum’s latest “For the Greener Good” discussion on green schools. Joanne Silberner, Health Correspondent, National Public Radio, moderated a panel featuring Dr. Howard Frumkin, Director, National Center for Environmental Health / Agency for Toxic Substances and Disease Registry, U.S. Centers for Disease Control and Prevention; Steve Turckes, Director of K-12 Educational Facilities Group, Perkins+Will, and Glenn Cummings, Deputy Assistant Secretary, U.S. Department of Education. According to Steve Turckes, Perkins + Will, sustainability was best defined by the Brundtland Report: it means meeting the need of the present without compromising the ability of future generations to meet their needs. While sustainable design isn’t unique to schools, green schools must have lower energy and water usage, daylighting, and up-to-date mechanical systems. To be sustainable, these schools must also be sited in walkable environments. “Green + healthy is the real sweet spot,” said Dr. Howard Frumkin, U.S. Centers for Disease Control and Prevention. 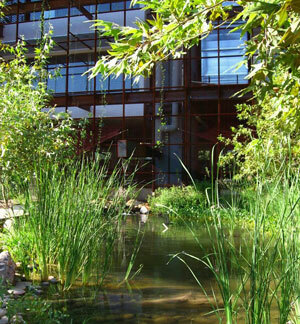 While many buildings are green, some may not be healthy — you want to have both. People need physical activity to be healthy. Turckes said the vast majority of those older buildings haven’t benefitted from newer technologies. “There have been huge advances in building technologies.” But still, many older buildings are mold-infested and feature outmoded air ventilation systems. The perception of the higher cost of green schools may present an obstacle. “There is no extra cost to sustainable design — it’s embedded, a form-driver. We use integrated interdisciplinary teams to do sustainable design up front, thereby removing inefficiences and saving costs.” However, with tight budgets, some schools still see commissioning agent and U.S. Green Building Council (USGBC) accreditation costs as a burden. To fight this: Turckes says some schools use the sustainable design process, but go green without getting the certificate. Frumkin added changes are needed to the built environment, policy, and behavior. He cited Safe Routes to Schools, and No Child Left Inside, two major movements, as very positive. He also called for high fructose-drinks and vending machines to be removed from schools. Cummings said sustainability curriculum needs to be further incorporated into schools so the U.S. can scale up for the green jobs of the future. 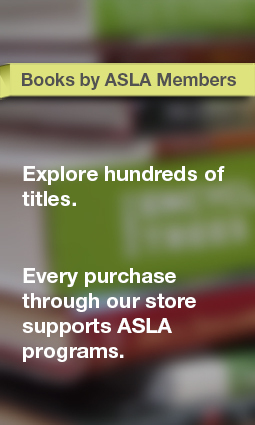 (see earlier post). One audience member noted, however, that even if sustainability is on teachers’ radars, it’s often not included in “No Child Left Inside”-mandated tests, so it gets bumped. 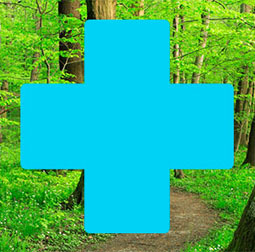 In terms of the future of health and sustainability, “the recently passed health reform package will lead to a new focus on the prevention of illness,” Frumkin said. “Green buildings, sustainable neighborhoods, healthy lifestyles — my dream is to marry all these together.” In the future, he said, perhaps health specialists will also be involved in green building design from the beginning. Image credit: 2010 Professional Honor Award, General Design. 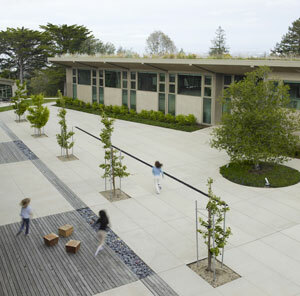 Nueva School, Hillsborough, CA U.S.A. Andrea Cochran Landscape Architecture, San Francisco, U.S.A. The Telegragh (UK) created a slideshow of topiary around the world, showing examples of literary, religious, geometric, spiral, animal, and other fantastic designs from France, UK, Germany, Italy, and (as seen above), Thailand. 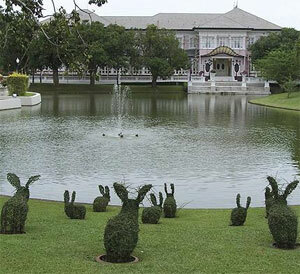 Topiary relates to the art of clipping trees, shrubs and sub-shrubs to create sculptures. According to Wikipedia, the word derives from the Latin word for an “ornamental landscape gardener, topiarius, creator of topia or ‘places’.” In many cases, trees are sculpted with shears, taking shape over time. In others, wire cages are used to guide plants into sculpture. A range of plants and vines can be incorporated. See the slideshow and more topiaries. 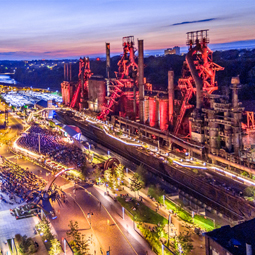 The American Society of Landscape Architects (ASLA) announced the winners of the 2010 Professional Awards, representing the best in landscape architecture around the world in the categories of general design, residential design, analysis and planning, research and communication. 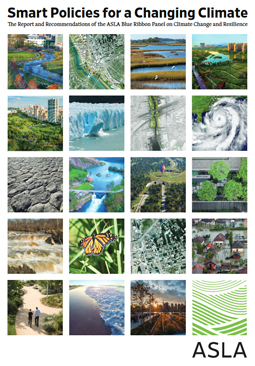 The jury considered 618 entries – the largest number in ASLA history – from 20 countries around the world, selecting 49 projects for distinction. 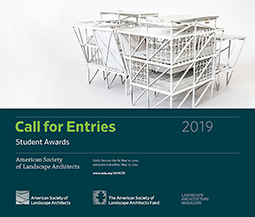 The awards ceremony will take place on Monday, September 13, at 12 noon during the ASLA Annual Meeting and EXPO in Washington, D.C.
View the full list of award winning projects. Dutch Landscape architecture firm West 8, working together with Diller Scofidio + Renfro and Rogers Marvel, has released the master plan for Governors Island, a 172-acre island off the southern tip of Manhattan. The first phase of the master plan details the roll-out of 2.2 miles of waterfront promenades and a new 40-acre park. The new design features artificially-created hills that focus attention on the park’s center, as well as a “hammock grove,” a grotto-like shelter, athletic fields and marshlands, writes the The New York Times. The New York City government has allocated more than $40 million in funds to the new plan, but will need to raise more than $220 million for future phases of development. Control of the island recently passed from New York state to the city, enabling Mayor Bloomberg’s plans for the island to move forward. The Governors Island master plan includes the development of a new ferry landing area and shaded lawn overlooking the Lower Manhattan skyline. 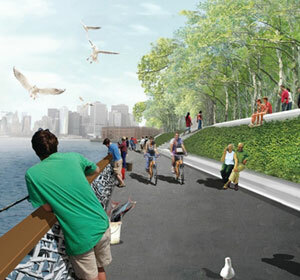 According to Fast Company, a man-made canyon will also create framed views of the Statue of Liberty. The entire master plan call for a network of promenades to circle the entire island, but the first phase will cover only the northern half. Walking along the promenade, visitors will get views of everything from the Statue of Liberty to Brooklyn Heights. The southern end of the island will feature man-made marshes and tidal basins. “A raised concrete walkway wraps around the marshes at the tip of the island, so that visitors should feel as if the edge of the land were dissolving around them. 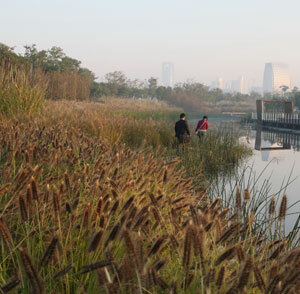 To add to the sensory experience, [Adriaan] Geuze [of West 8] plans to plant the area with strong-smelling plants, like sea asparagus and lavender.” The marshes may be designed as “green” or “soft” infrastructure, providing a natural system to accomodate sea level rises that threaten New York City. Geuze of West 8 seems very focused on climate change and incorporating adaptation schemes into his designs (see earlier post). 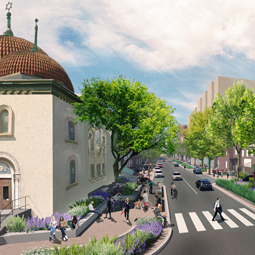 Ourossoff says the site’s building plans are still in flux. New York University is exploring adding dormitories and classroom space. There’s also discussion about luxury hotels or a conference center. 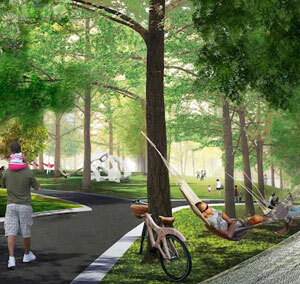 Read the article and see a slideshow of renderings of the new Governors Island. Also, learn more about the upcoming changes to the Island’s governance with its move from New York State to city control. 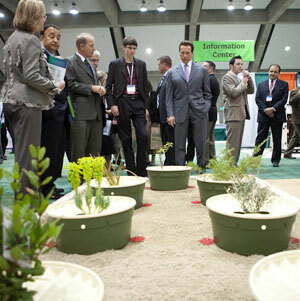 In 2003, Dutch businessman Pieter Hoff formed AquaPro, a firm which launched the “Groasis Waterboxx,” a device designed to enable trees and crops to grow in the driest parts of the earth. According to The New York Times’ Green Inc blog, the waterboxx, a kind of tree “water battery,” is about the size of a car tire and made from polypropylene. An opening at the center of the box provides a space for a plant or tree to germinate and grow. The ultimate motivation for the device: worldwide reforestation, even in the most difficult and driest terrains. Planting trees can help create jobs, combat erosion, and mitigate the effects of climate change in developing countries. Hoff tested the device in the Sahara desert in Morocco for three years. Trees planted during the summer survived, demonstrating average growth of more than 90 percent in their first year. AquaPro says “tests have shown that the trees, after the Groasis waterboxx is removed, continue to survive.” Just 10 percent of a small test group planted without the boxes lived on. Green Inc. adds that more trials are planned for 25 sites in eight countries. For the 40th anniversary of Earth Day, organizations around the world are sponsoring events, new publications, and programs. In the U.S., the Earth Day Network is organizing two full days of events on the National Mall in Washington, D.C. on April 24th and 25th. See updated coverage of Earth Day at Google. Plastics in sea water attract bacteria and absorb polychlorinated biphenyls. Continual wave energy breaks plastics into tiny plastic components eaten by fish, which are then eaten by people. In other cases, the garbage that hasn’t been broken down also causes major problems for sea life. On this year’s Earth day, a whale found dead off the coast of Seattle was found to have more than “50 gallons in volume, from hand towels, surgical gloves, duct tape to sweat pants” in its stomach. The local news station’s Web site says the whale was feeding off the coast. The Huffington Post argues that Earth Day launched a real movement. In the U.S. alone in 1970, more than 20 million people participated in Earth Day events. However, since then, plastic production has only exploded. “Use of single-use disposable plastic and plastic pollution grew exponentially. 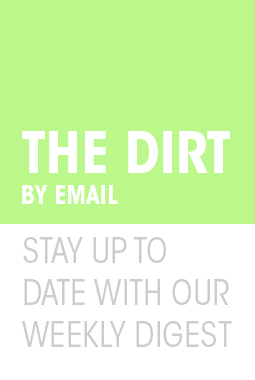 The plastics industry stepped on the gas, hired lobbyists and marketers and did their thing. Profits from plastics soared. Life became more ‘convenient’.” In return for convenience, we’ve gotten massive garbage patches. Some scientists are working on alternatives to plastics. While recycling can lead to reuse of many plastics, they can only be down-cycled, and fossil-fuel-based break apart after continual recycling. There aren’t currently any “cradle to grave” fossil-fuel based plastics. Wikipedia lists a range of bioplastics or organic plastics derived from renewable biomass sources, such as vegetable oil, corn, or various starches. However, many of these new technologies haven’t scaled up so the costs remain high. 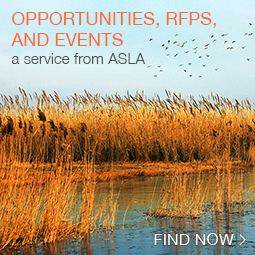 Regulatory or legislative action on plastic waste products may be part of the solution. In the world of technology, the EU’s WEEE-ROHS system has helped ensure hazardous elements in electronic products are captured and reused. The European Union describes the system: “The legislation provides for the creation of collection schemes where consumers return their used e-waste free of charge. The objective of these schemes is to increase the recycling and/or re-use of such products. It also requires heavy metals such as lead, mercury, cadmium, and hexavalent chromium and flame retardants such as polybrominated biphenyls (PBB) or polybrominated diphenyl ethers (PBDE) to be substituted by safer alternatives.” The EU is also exploring expanding WEEE-ROHS so it can tackle the “fast increasing waste stream of such products.” Perhaps a similar system is needed so that fossil-fuel-based plastic components are designed to be fully recycled, and any waste biproducts are addressed early in the design and manufacturing process. Across Europe, there are now 400 of these plants turning garbage into energy. Most of these are located in Denmark, Germany, and the Netherlands. While incineration has taken off across the European Union, inefficient, methane gas-producing landfills still remain popular in the U.S. A country of 300 million people, the U.S. has less than 90 incinerator plants, even though the E.P.A. now classifies burned waste as a renewable energy eligible for subsidies. To limit demand for plastic, there are legislative and regulatory efforts to reduce use of plastic bags and other common applications. In Washington, D.C., San Francisco, and other U.S. cities, there are now taxes on plastic bags (see earlier post). Some countries, like China, Russia, Uganda, Ireland and South Africa, have announced total bans on plastic bags. 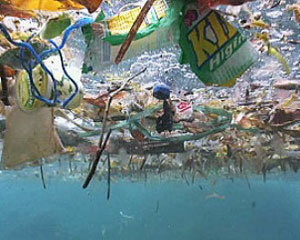 However, this needs to occur worldwide to get plastic materials out of oceans. According to The Times of India, around 500 billion plastic bags are used worldwide. India’s plastic waste alone is around 4.5 million tonnes a year. This is the result of every day use: 10 to 12 plastic bags are used each day by every Indian household. Lastly, some designers are trying to turn those massive ocean garbage patches into resources. Rotterdam’s WHIM Architecture came up with an impractical but interesting idea — “Recycled Island,” a plan to turn those continent-sized floating garbage patches into habitable islands. Good magazine writes: “the island would be built out of the muck already out there polluting the Pacific, which would clean the ocean of the debris and also put that waste to use. Ridiculous, yes. Impossible, probably.” But can floating ocean garbage be turned into a resource (perhaps, even a renewable energy source)? Add your thoughts. How would you address plastic supply and demand? Also, check out Ocean Trust Film.org, a group working with the producers of “Super Size Me,” to create a documentary on the Pacific Garbage Patch. The U.S. House Urban Caucus’ Urban Parks Taskforce organized a briefing on urban parks and their role in creating green spaces which can revitalize neighborhoods, improve health, and create jobs. Parks also play a major role in fighting childhood obesity, providing safe and healthy places to play. Caucus members heard from Joe Hughes, Professor, Georgia Institute of Technology; Susan Wachter, Professor of Financial Management, Wharton School of Business, University of Pennsylvania; Eddie George, ASLA, former NFL player and landscape architect; and Salin Geevarghese, Senior Advisor, Office of Sustainable Housing & Communities, U.S. Department of Housing and Urban Development (HUD). The National Recreation and Parks Association (NRPA) and ASLA played key roles in putting the panel together. Introducing the briefing, Representative Chaka Fattah (PA), who is chair of the caucus, said a new consensus is forming among the administration and legislative branch: urban parks can’t be separated from broader urban revitalization efforts. However, Sires said small city mayors still need to continually hunt for funds wherever they can get them, “pulling a little from here and a little from there,” to get their local park projects off the ground. To increase the federal funds that can be used for park investment, he led the development of the Urban Revitalization and Livable Communities Act. Susan Wachter, Professor of Financial Management, Wharton School of Business, University of Pennsylvania: “Parks help create communities of lasting value,” which Wachter says is the true measure of neighborhood sustainability. “Parks bring nature to the city, create safe spaces, enable social interaction, sequester carbon.” Most importantly, Wachter added, parks can create environmentally and economically resilient communities. 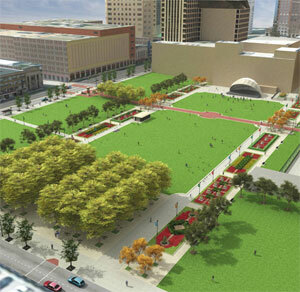 The new 9-acre park George is designing in the mall’s place, Columbus Commons, will tranform the space into a sort of Millennium Park for the city. 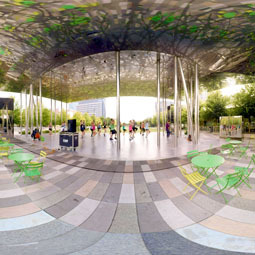 The park, which will open in 2011, will offer mixed-use spaces and ground-level retail. There will be green roofs on parking garages. Salin Geevarghese, Senior Advisor, Office of Sustainable Housing & Communities, U.S. Department of Housing and Urban Development (HUD): Geevarghese said the issues were all interconnected. “People don’t see these things as separate and don’t live these things separately.” As a result, EPA, HUD, and the Department of Transportation forged a partnership on sustainable communities (see earlier post) to deal with the cross-cutting issues related to transportation, green space, and housing. Echoing arguments made by Ron Sims, Deputy Secretary of HUD (see earlier post), Geevarghese said where you live, “your zip code,” can predict how healthy you are, how educated you are. “How can we disentangle that?” He thinks that community ownership is intimately linked with community safety, and requires investment in community infrastructure, including parks. Also, Geevarghese thinks the concept of green jobs need to be reformulated to include parks and recreation, or “conservation,” jobs. The federal government should be involved in local urban parks because they are just another form of infrastructure. Historically, the federal government has invested in infrastructure to get the country out of severe economic downturns. Green infrastructure is not just about environmental sustainability, but also about creating communities of value, and reversing disinvestment in urban cores. The private sector needs to be more involved in urban park financing and development. Non-profits also need to be at the table. Representative Chaka Fattah said foundations have played a “energizing role” in revitalizing parts of Philadelphia. At the regional and even local levels, the transaction costs involved in getting everyone to the table are high. The Dumbarton Oaks Garden and Landscape Studies Program, which is affiliated with Harvard University, organized a lecture on the restoration of two of the most important Mughal empire landscapes — Humayun’s Tomb in New Delhi, and the Bagh-e Babur in Kabul, both UNESCO World Heritage sites. The Aga Khan Trust for Culture, an Islamic philanthropy, has spent the last few years undoing the damage caused by colonization and, more recently, urbanization. Ratish Nanda, an Indian architect, who organized the restoration work, said the threats to cultural heritage are real. “Right now, no historically relevant Mughal Garden exists in Pakistan today.” Restoring Mughal landscapes means creating a plan for sustainability and addressing the economic and social factors that support cultural landscapes. Mughal landscapes originated in Persepolis, Iran, in 7BC. Inspired by Koranic descriptions of paradise, the gardens attempted to offer visual representations of heaven. Humayun’s Tomb, New Delhi: The tomb of Humayun, one of the Mughal emperors, predates the Taj Mahal by two centuries. This site in New Delhi is one of the densest set of Muslim buildings in the world. During the era when the tomb was built, it was auspicious to be buried near saints. Given a Sufi saint is buried in the area, Humayun decided to create his tomb there as well. The site is imbued with colonial history. After the failed Indian Uprising in the mid 180o’s, the last Mughal emperor and his sons fled to Humayun’s Tomb. Once the British put down the uprising, which Indians view as the first major step in their independence movement, they brought the emperor out of the tomb and exiled him to Rangoon, Burma, while executing his three young sons. Soon more and more Brits were coming over to see the site of Mughal’s final defeat. So the local colonial administration decided to turn Humayun’s Tomb into a tourist site. To demonstrate their mastery over the Mughals, the British intervened in the landscape design, replacing the Islamic landscape design with English country gardens. Since then, there have been four efforts to restore the gardens to their original Mughal design, yet each successive effort ended up doing more damage by moving water channels and altering the original design. In 1999, Aga Khan’s trust completed an MOU with the Indian government to restore the site to its original design. Nanda said the site “had been beautified, but not restored.” Excavating the site, the trust found the early fountains. They recreated almost 180 groundwater recharge pits, dug out wells, and restored the rainwater system. Lemon, lime, and hibiscus plants were brought back. All sandstone used was hand-chiseled. Restoring the tomb and gardens created opportunities for employment. “The great thing about conservation work is that it involves lots of jobs.” They first rebuilt the walls surrounding the site — this involved creating almost a mile of mud walls by hand. Like other orchards in the region, the garden is broken into a grid and features zones with different types of fruit plants — cherries, apricots and quinces now grow in the gardens, drawing some 15-20 thousand people for picnics each Friday. Nanda said the restoration work on both sites is incomplete. Aga Khan believes the sites need to be integrated into the communities through education, training and job programs, so they can stand on their own and survive long-term. 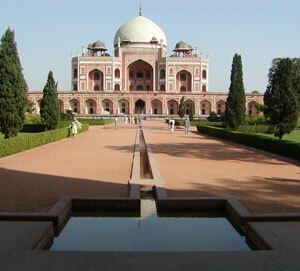 There are plans to make Humayun’s Tomb in New Delhi accessible to more New Delhi residents, particularly students. The Bagh-e Babur now has events spaces and an adjacent pool that earn revenue to pay for the garden’s upkeep. Every business associated with the gardens must be included in economic sustainabilty plans if the restoration is to take hold, Nanda argues. The trust has more projects coming in New Delhi. Plans are underway to turn a New Delhi British tree nursery into a 70-acre publicly-accessible arboretum. “Right now, it’s still a government tree nursery, and there’s no public access.” The goal is to turn it into an educational park. A landscape master planning process underway will restore the original New Delhi habitat. Read more about Humayun’s Tomb and Bagh-e Babur. 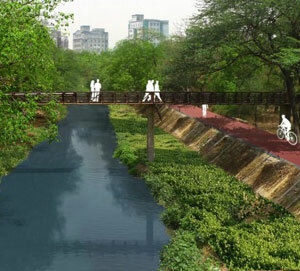 CNN writes that Indian architect Manit Rastogi wants to transform New Delhi’s 350-kilometer network of “filth-filled, age-old drains” into scenic waterways lined with walkways and bicycle infrastructure. Rastogi believes using bio-remediation technologies, the dirty streams that feed household sewage into the River Yamuna could be turned into green infrastructure. According to CNN, New Delhi, a city of 17 million, uses nullahs, a centuries-old system of channels, as stormwater management systems. However, recently, the nullahs have been inefficiently transporting untreated waste. Given that almost five million residents walk to work each day, often passing the nullahs, the stink makes commutes unhealthy and unbearable. Additionally, there’s no housing near the channels because of the smell, creating missed opportunities for housing in a city in need of new apartments. Rastogi sees renovating the nullahs as an opportunity to apply green infrastructure. He has identified three locations as sites for experiments. 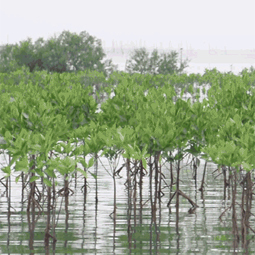 Using bio-remediation technologies, enzymes can be used to attack contaminants. “We can treat sewage at its source with the help of mini-equipment before it flows into the nullahs,” Rastogi said. While the enzymes are breaking down the sewage and cleaning the water, tracts around the channels can be turned into “landscaped passages.” Rastogi said: “The city will then be interconnected with an eco-friendly and safe transport network.” Given the network is already some 350-km long, the system could really become city-wide multi-use infrastructure. Read the article and see a brief video. Also, check out Rastogi’s Delhi Nullah Web Site.